The move is a direct response to relentless competition from e-commerce players like Amazon.com and eBay, which have been consistently pushing down delivery times and prices for years. Customers of Amazon Prime, for instance, have grown accustomed to free next day delivery. Amazon has even tantalized shoppers with the idea of same-day delivery via drone. Now department stores hope to get ahead of that frightening (in more ways than one) prospect with same-day service of their own. The retailers have partnered with California-based Deliv, which uses crowd-sourced couriers to deliver goods from store-to-stoop. In an article in the Chicago Tribune [subscription required], Deliv’s CEO and Founder Daphne Carmeli says “pricing has not yet been announced, but it will be very market competitive.” Only products available in local stores will be available for same-day delivery, but Carmeli said that shouldn’t be an issue — Macy’s and Bloomingdale’s have already adjusted their inventory to allow online customers to pick up purchases in stores. JLL’s Head of Retail E-commerce Distribution , Kris Bjorson, believes that Macy’s and Bloomingdales are recognizing the new reality that stores aren’t just stores anymore — they’re distribution and fulfillment centers, too. “The ‘ship-from-store’concept will transform retail distribution strategy at the store level,” Bjorson says. This evolution could mean good things for the size and shape of industrial and retail real estate. Bjorson expects to see continued demand for more one-million-square-foot warehouses as well as the need to allocate up to 15 percent more space for fulfilment inside traditional retail store locations. 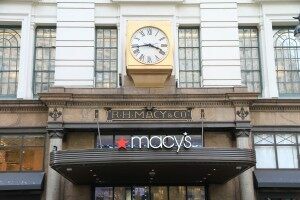 Department stores versus e-commerce: the retailer race is on. Who’ll be first to your door?